I went to see the Lion King Broadway Play in New Orleans. It was beyond amazing! I love theater and watching people perform. I was in awe during the entire production. Art is just absoultely beautiful. For the event, I decided to dress comfortable, yet nice. I wanted to be simple with a touch of glam. Check out my outfit choice below. 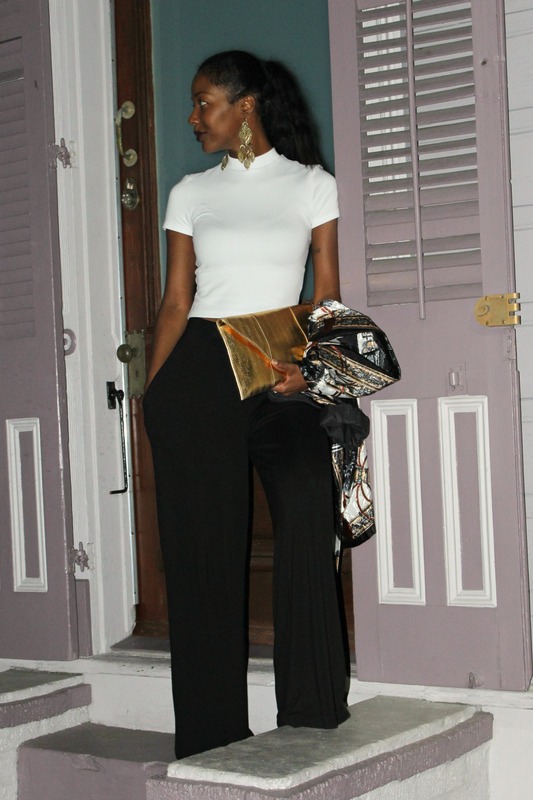 I wore a crisp, white top from American Apparel and wide leg ASOS trousers (I purchased the tall fitting pants). To fancy the look up, I added my vintage blazer from @shopvintagebowtique (Instagram Boutique), some rust colored chandelier earrings (old, similar pair here), and my gold clutch (old, similar one here). Lately I've been crazy busy, and I don't know if I'm coming or going!! There was a time when my couch would be my excitement for the evening and weekend....boy have times changed. My social calendar is out of this world these days, but I'm not complaining. I always try to appreciate each phase of my life, because eventually - it will change.